Trinity wedding bands are gold designs for both women and men. The Trinity is an unending Celtic knot that is both mystical and infinite. Please note that any Trinity Wedding Band pictured on this page in YELLOW gold is available as WHITE gold and vice versa. Any two-tone band is also available in the reverse combination. Please use the drop down to select your choice of gold color. All Irish white gold is mixed with palladium, not with nickel. Palladium is a platinum type metal. 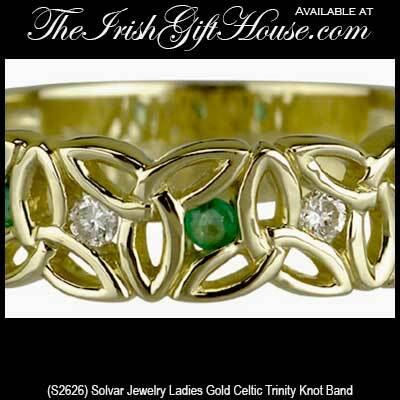 Solvar Irish Jewelry, Ladies 14K Yellow Gold, Emerald and Diamond, Celtic Trinity Knot Band. 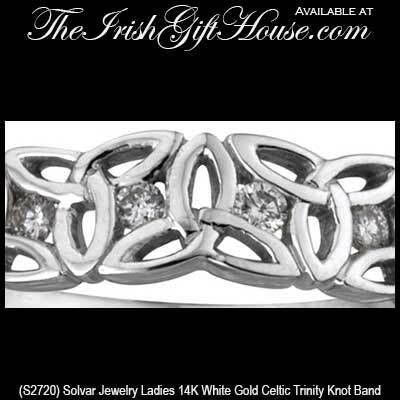 Solvar Irish Jewelry, Ladies 14K White Gold, Diamond Celtic Trinity Knot Band. This gold Celtic wedding band for women features engraved Trinity Knots and Shamrocks. 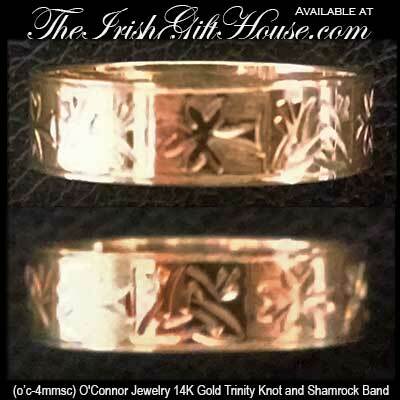 This gold Celtic wedding band for men features engraved Trinity Knots and Shamrocks. Eternal Celtic Wedding Bands - Celtic Trinity Knot. Select Either 14K White Gold Center with 14K Yellow Gold Rims or 14K Yellow Gold Center with 14K White Gold Rims. This Celtic Trinity Knot Wedding Band for either Ladies or Men is part of the Eternal Celtic Wedding Bands collection. Select Either 14K White Gold or 14K Yellow Gold. Many of these Celtic Wedding Bands are crafted by TJH Limited, the largest manufacturer of precious metal jewelry in Ireland.